MAP LOCATION OSI maps of 1838-1845 and 1898-1913 place it in the townland of Galloping Green North on both. ​GENERAL A Victorian house with 3 gatelodges (one still extant midway between Ardlui Park and Ardagh Drive on Newtownpark Avenue). The other two were on Carysfort Avenue and although the gatelodges are gone, part of the gate piers still survive. 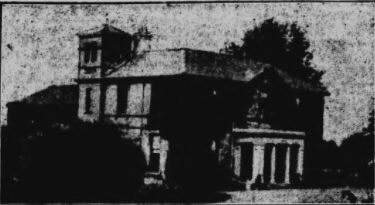 The name of the house was changed to Ardagh Park in 1940. A relatively small house with various extensions and stabling on thirty four acres. Two story with glassed-in portico and an entrance hall with parquet floor with was 32.5' in length. In 1906 it was put on the market and its selling points included 7 bedrooms, a hot air system for heating the house and a Turkish bath. VALUATION In 1912 the valuation was 143 pounds. ​ROOMS On the 1901 census it is noted as having 24 rooms occupied by family. SOURCES Topographical Dictionary of Ireland 1837 Samuel Lewis, Thom's Directory, NAI Census, Parish Records.